Things I wasn’t expecting to hear this morning: chillwave remixes of Rose Melberg’s mom-folk classic, Homemade Ship. 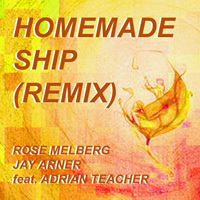 And yet, here is Homemade Ship (Remix), six tracks re-envisioned by Melberg pal Jay Arner (of Fine Mist). The singer’s porcelain voice works extraordinarily well over synthesizers and fake hand-claps — she could’ve taken these songs on tour with ’80s Kate Bush and been a big star. Stream/download the collection after the jump for $5 and don’t sleep on the Rawkblog heroine’s other new record, Brave Irene’s s/t EP.